New owner/local developer, Fore Street Partners, is happy to welcome Higher Grounds Café to 45 Wharf Street. In January of 2016, the owner and its affiliated companies purchased approximately 50,000 SF of space on Fore and Wharf Streets and are committed to diversifying the tenant base and upgrading this block. Known as a popular street for nightlife, 51 Wharf night club previously occupied 5,000 square feet in the building. The space will now be replaced by the Higher Grounds coffee shop and bakery and will feature a new façade. This is a big step in achieving a first class destination for new tenants and their customers. 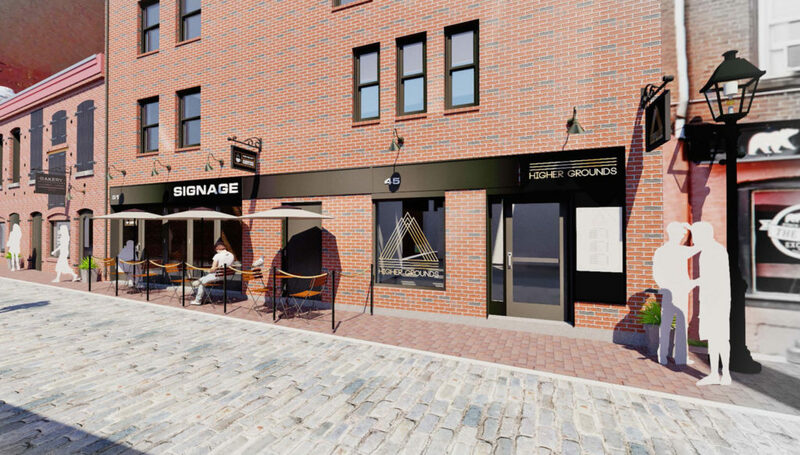 In conjunction with Fore Street Partners, NAI The Dunham Group is reaching out to the market in search of restaurants, arts or retail users to fill the remaining space and complete the goal of transforming this block of Wharf Street. The owner is flexible and welcomes creative ideas to help turn this area into a destination for food, coffee, retail and pubs. The remaining 3,500 square feet is available for lease. It can be subdivided into two smaller spaces and features a fully built-out kitchen for food users.